EAGLEVILLE, PA, February 15, 2018 – Streamlight® Inc., a leading provider of high-performance lighting and weapon light/laser sighting devices, introduced the ProTac® HL 5-X USB rechargeable system, the newest and brightest addition to the ProTac® series of tactical lights. Delivering up to 3,500 lumens, the new light comes with two of Streamlight’s new 18650 lithium ion batteries with an integrated micro USB charging port and a charge cord. A ProTac HL 5-X with four CR123A batteries is also available. The ProTac HL 5-X USB offers three selectable programs and is powered by either two rechargeable 18650 USB batteries or four 3-volt CR123A lithium disposable batteries. This multi-fuel capability enables users to charge the light on the go, or insert cell batteries when a charging source is not available. The ProTac HL 5-X USB uses the latest in power LED technology for extreme brightness. When using 18650 batteries, it delivers 3,500 lumens on high, and a run time of one hour and 15 minutes. It also provides 2,500 lumens and a run time of 1 hour and 30 minutes on the high setting when using CR123A batteries. Run times on low are 10 hours and 30 minutes, and 11 hours and 30 minutes, respectively. The light features a TEN-TAP® programmable switch, which allows for user selection from among three programs: high/strobe/low (factory default); high only; or low/medium/high. Fabricated from 6000 series machined aircraft aluminum with an anodized finish, the ProTac HL 5-X USB features a multi-function, push-button tactical tail switch that permits one-handed operation. It also has a “sure grip” rubber sleeve to ensure users never lose their grip. The ProTac HL 5-X USB is 9.53 inches in length and weighs 1 pound, 2.4 ounces with four CR123A batteries and 1 pound, 3.4 ounces with two 18650 rechargeable batteries. The light has an IPX7-rated design for waterproof operation to one meter for 30 minutes, and is impact resistance-tested to one meter. Available in black, the ProTac HL 5-X USB and the ProTac HL 5-X have MSRPs of $175.00 and $145.00, respectively. 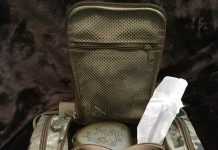 Both come with a lanyard and Streamlight’s Limited Lifetime Warranty. 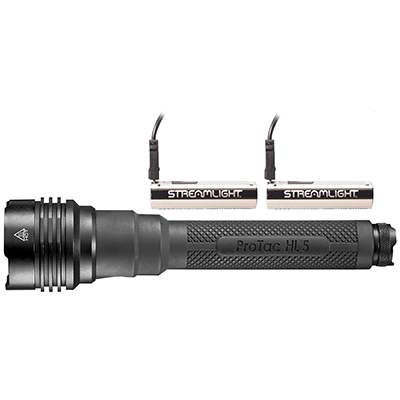 Based in Eagleville, PA, Streamlight, Inc. has 45 years of experience making tough, durable, long-lasting flashlights designed to serve the specialized needs of professionals and consumers alike. Since 1973, the company has designed, manufactured and marketed high-performance flashlights, and today offers a broad array of lights, lanterns, weapon light/laser sighting devices, and scene lighting solutions for professional law enforcement, military, firefighting, industrial, automotive, and outdoor applications. Streamlight is an ISO 9001:2008 certified company. For additional information, please call 800-523-7488, visit streamlight.com or connect with us on facebook.com/streamlight; twitter.com/Streamlight; instagram.com/streamlightinc; and youtube.com/streamlighttv.